Blondie and Brownie: Let Me See Your Pretzel Cone! Last night I treated my mom to a pistachio ice cream in a pretzel cone and it got high marks. The pretzel cone holds up well to the ice cream and stays nice and crunchy. Like any good pretzel the cone has a wee bit of salt on it. Perfect when paired with the creamy nuttiness of the pistachio ice cream (they Uncle Louie G's pistachio isn't shy on the whole pistachio pieces). The pretzel cone was truly wonderful. Just the right combination with the pistachio ice cream. Yum! Thank you, Brownie. I grew up eating Pretzel ice cream cones! That was in Pennsylvania in the 80s... moved to the south in '90 and haven't had one since. :*( This looks awesome. O M G is that clever or what? Believe it or not, the last time I had ice cream on a CONE was a long time ago, after discovering that many cones have trans fat. I think I may revert to this pretzel cone! Looks delish! 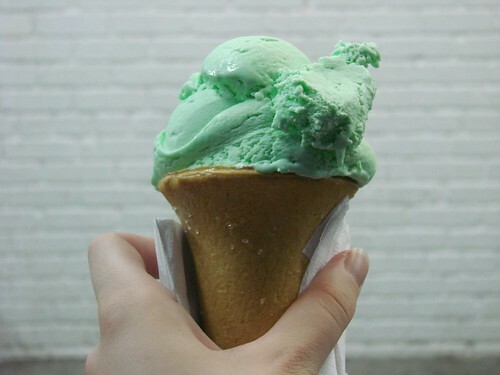 You know what I like about this picture of the pistachio/pretzel cone? It's like Lady Liberty's torch to a very hot summer. I went there today and they had stopped selling them. :( They were apparently not cheap to stock and unpopular. Oh no! No more pretzel cones? That is a shame. At last we had a sturdy cone for all that delicious ice cream and we've been cut off!